No matter how appealing they make them look and how many discounts and offers you find on the market, the cold hard fact is that the holidays are nearly upon us and there’s not much more we can afford. While we were looking for an affordable option for this year’s possible smartphone gifts, we came across the LG OPTIMUS L70 that downright shocked us with its abysmally low price. Getting it without a contract will probably cost you less than getting a much newer smartphone on a whole two-year commitment contract. Sure, it probably isn’t any jaw-dropping embodiment of state of the art technology or mind-boggling performance, but it’s still a touchscreen phone that will get the job done. The fact that it can connect to 4G networks in a huge plus too. There’s only so much you can expect from a phone of this caliber. But the things that it manages to do, it does well. Considering the very low price class that it falls into, it can make for a great last minute gift for your kids or other family members, especially if they prefer pre-paid cards over long-term commitments. The first time I saw an LG OPTIMUS L70 on the shelf I actually thought to myself that it’s not a bad looking phone. And it really isn’t: it may not innovate anything in terms of design and doesn’t even come close to the gigantic phones of our brimming with technology days, but there’s really not much to complain about when it comes to the looks of this small smartphone. It may not reach the overall size of the current trends, but still exceeds the iPhone 5’s size. For its 127.2 x 66.8 x 9.5 mm dimensions, it manages to pack a 4.5 inch display and sums up a 67.8% screen to body ratio. That’s not too much to speak of and mostly caused by the relatively large bezel, especially at the top and bottom. However, the LG Optimus L70 has an aspect ratio that you’re most surely not used to; while it’s not that exact ratio, it’s mostly similar to 16:10 layouts, making it look and feel wider than your usual smartphone. Surprisingly, even considering the 9.5 mm it scores in thickness, it’s not difficult to hold at all and even feels comfortable doing so. With the only downside that typing texts on it for example will probably make it more than difficult for you, especially if your hands are more on the large side. It doesn’t come in much heavier than your average Joe phone, weighing only 124 grams; if anything you’ll find it even lighter than most of nowadays’ smartphones – but that’s mostly because of its smaller scale. 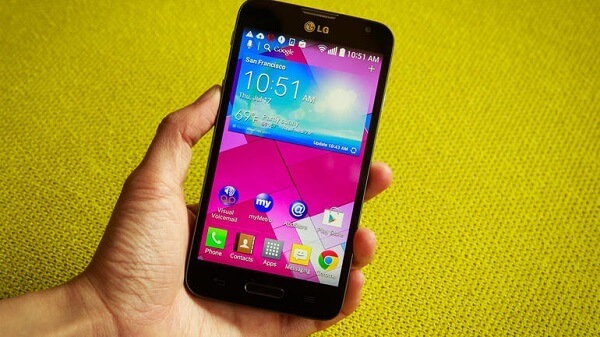 I mentioned earlier that the LG Optimus L70 doesn’t innovate much in terms of design. That is mostly because looking at the LG Optimus L70 makes me think of some older Samsung phones, before gigantic displays became the current fad. The way its front face looks, featuring touch-sensitive Back and Options buttons, with your clickable Home button slapped in the middle is reminiscent of Samsung Galaxy S2 or Samsung Galaxy S3 Mini. But it actually ends up looking sleeker and more delicate than that, thanks to the larger display and sharp but slightly curved and softer corners. You’ll even notice the front facing camera along with its own LED flash on the top right corner, making it look anything but outdated. The edges of the phone, even if a lot thicker than what we’ve grown accustomed to with all these new smartphones aspiring to be paper-thin soon, are well rounded to increase grip on it and feature most function buttons. They’re set all around the metallic frame going all around the phone: the right side features a single sleep or power button, while the left hosts the volume rocker and a Quick Launch button – something that will come in very handy and that you won’t find on many other smartphones, especially budget models. The top is where you’ll find the regular 3.5 mm headphones jack – a more suitable location considering that the phone is relatively small and pocketing it is actually an achievable feat; I’ve yet to own the pair of jeans that will fit anything of the likes of iPhone 6S Plus in their pocket. The bottom of the LG Optimus L70 is where you’ll find the microUSB charging port. The phone was released in the first quarter of 2014; it’s an overstretch to hope for anything such as Type-C USB charging for it. The back of the LG Optimus L70 is a bit of a marvel, at least for the black version that we’ve used for this review. 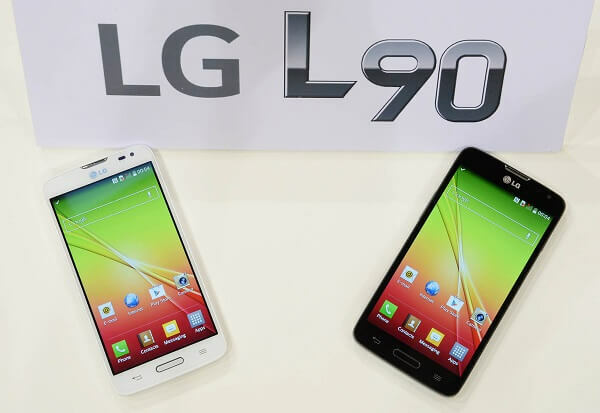 While the only other LG Optimus L70 white variant features a plain and matte back cover, the black one features a hexagonal mosaic pattern on its back in different shades of gray. That gives off a very fun grainy look to the back that’s a lot more appealing than your regular classic black. On the back rests the rear camera sensor, much larger than its front equivalent with its very own LED flash as well as the LG and metroPCS logos. 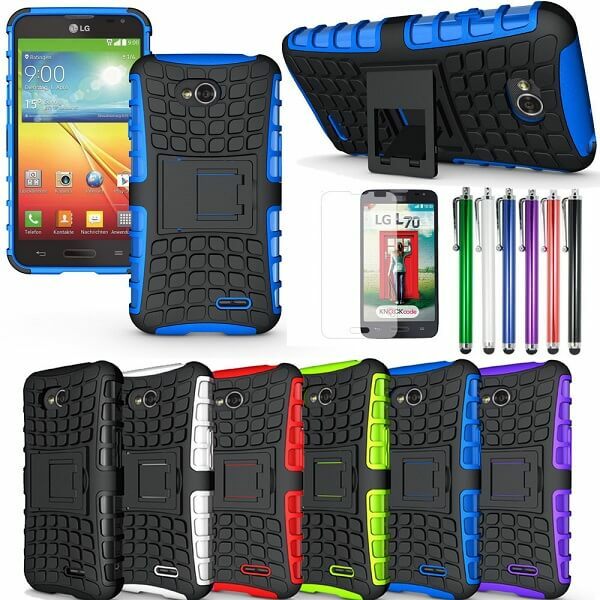 Still, if that is not to your liking, LG put at your disposal the possibility of purchasing an LG Optimus L70 case. 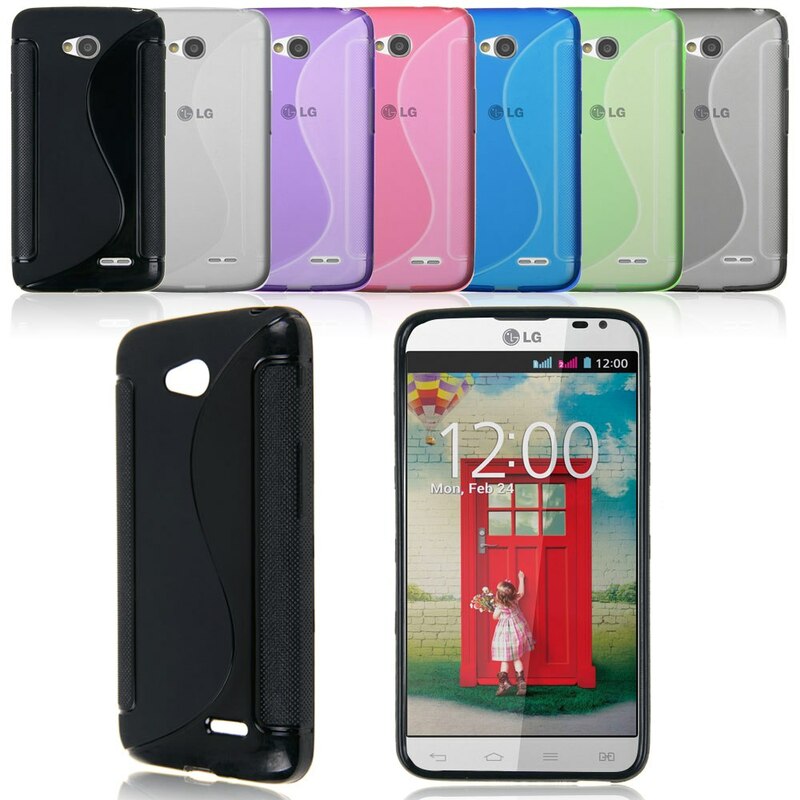 One of the catches of the LG Optimus L70 is the back cover. 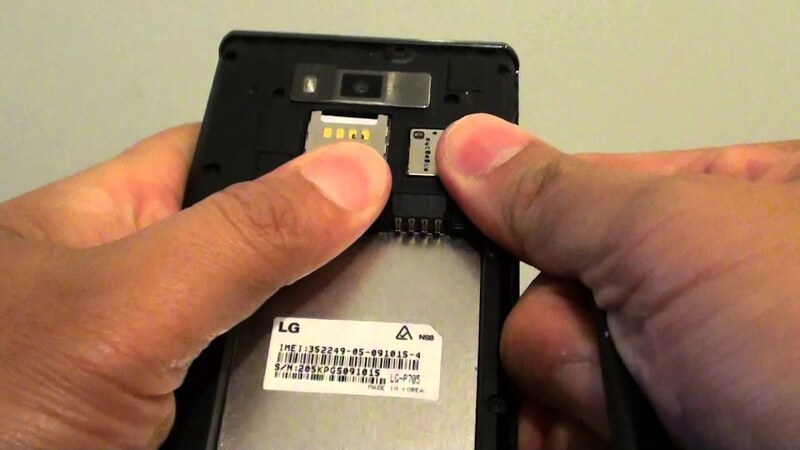 Unlike most of the smartphones these days, you actually get to remove the back cover and thus gain access to the battery compartment and more. The reason I say more is because under the battery you’ll find two very important slots: both the Mini SIM and the microSD slots. Sadly, there seems to be a downside to most good things in this world: you can an easily accessible and just as easily replaceable battery, but that means that every time you want to swap out your microSD card, you’ll have to turn the phone off and take out its battery in order to do it. Plus, you’d have to go through the entire process of taking the cover off as well if you opt for any of the LG Optimus L70 cases. So to sum it up, design wise the LG Optimus L70 is quite nice to look at even if it doesn’t come up to par with what you see in the flashiest, bright lit shelves these days. I will start off this section by straight out saying that the LG Optimus L70 display may come as a bit of a disappointment to some as it’s far from bright and highly detailed. At 4.5 inches, the display isn’t as large as one might be used to, but you won’t – at any point – struggle to read or view content on it. It makes up through width if anything, sporting a more unusual aspect ratio. The display is of the WVGA variety – abbreviation for Wide Video Graphics Array – and only sums up to a resolution of 800 x 480 pixels. That accounts for a 207 ppi pixel density value – far from one of the best you can find on a wide variety of hand-held devices. Because of that, watching movies or running graphic-intensive apps on the LG Optimus L70 is not the best experience you will get. The image tends to get a little pixelated at times and you may even find yourself noticing a fair amount of grain and light distortion towards the edges. I’m fairly unsure why that even occurs in the first place but it’s something to take into account. The display is an IPS LCD capacitive touchscreen build, a fact that probably explains the relative brightness issues. Being the less expensive option for manufacturers, the IPC technology is also at fault for thicker devices. In essence, that means that you lose a fair amount of brightness and contrast potential at the cost of more natural looking colors. I’m going to stick to saying that viewing angles are decent but once again, not the best. The same goes for viewing what your screen has to display when in sunlight. If there’s any way for me to sum up what kind of hardware you’d be getting in the LG Optimus L70, I’d have to stick to calling it mid-range technology. None of the components will wow you but they still are a relatively decent pick for the phone’s price range. The only downright frustrating issue with it is the storage space, but we’ll elaborate on that later on in the review. The LG Optimus L70 packs a Qualcomm MSM8210 Snapdragon 200 chipset – making it a very old processor (it was released in in either 2010 or 2011 if memory serves well) that won’t be running any digital marathons soon. Thanks to the dual core 1.2 GHz Cortex-A7 core processing unit, you will be able to run most basic needs apps and it will serve you well when it comes to anything regarding emailing, net surfing and other less demanding applications. Put it to a multitasking stress test however, and the performance will become sluggish to say the least. With the chipset comes the Adreno 302 graphics processing unit. This GPU will work just fine with basic games such as the likes of Angry Birds, but more demanding games from 2013 and onwards will not share the same fate. Together with the modest 1 GB of RAM, you should probably stick to basic multimedia and not get your hopes up for anything that is more demanding than that. Now comes the part which I’ve mentioned in the intro and that is the storage space. The base amount you get is a rather shocking 4 GB hard drive only. Considering the operating system alone will clog up a portion of this, you’ll be left with little to none for your own necessity. On the bright side however, you do get the separate microSD storage which – albeit forcing you to open up the phone every time you need to swap out cards – can lend you a helping hand of up to 32 extra GB of storage space. 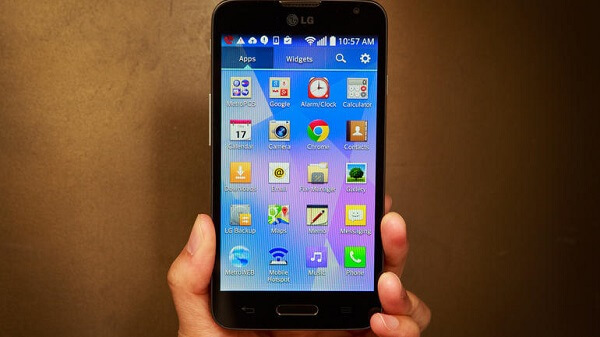 Straight from the factory, the LG Optimus L70 will come with preinstalled the Android 4.4 KitKat operating system. It’s not your regular stock Android version and instead runs the LG Optimus 3.0 user interface with its own twists and perks. You still get the regular Google apps without having to resort to applied skins and other third party applications. Your Chrome, Gmail, Google Plus, Hangouts and so on are the same as on any other Android device. The Optimus user interface brings its own input to the party, giving you apps such as QuickMemo – a nifty little thing that will allow you to doodle and make notes directly on the images you can see on the screen. Another example is the QSlide 2.0 that reminds me of how YouTube works on mobile devices when you minimize the video you’re currently watching so you can continue browsing without having to close it off completely beforehand. The QSlide allows you to minimize some apps while you use something else or accessing your menus. The Metro411 app that you’ll find is the touch that MetroPCS brought to the LG Optimus L70 and consists of a handy hub of nearby restaurants and businesses, inbuilt in your system so you don’t have to rely on websites or other third party apps that will eat at your already scarce storage space. Sadly, there’s no upgrade to any of the newer Android models on the horizon, not even to the 5.0 Lollipop, so users will most likely not get to experiment the newer Android to its full potential. The 5 megapixel rear facing camera will do a great job as long as you don’t try to expand the photos you take to resolutions higher than its native 800 x 480 pixels. While the maximum resolution you can get is 2560 x 1920, with a default 2240 x 1344, the photos start looking a little grainy and they lose detail the more you enlarge it when viewing it on your computer. This camera doesn’t employ the fastest shutter out there, forcing you to stand still a moment before the photo is actually taken. But otherwise, the photo quality ends up relatively good, clear and decently focused, even when in close range. 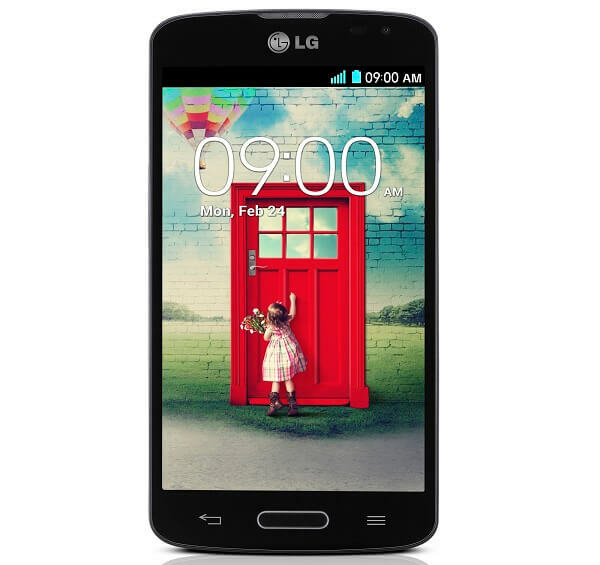 There’s a fun feature you’ll find in-built in the LG Optimus L70 phone. That is the voice-activated shutter that will know to take a photo when it hears queue words such as “cheese”. The software gives you a fair amount of settings and post-editing you can do such as 4 scene mode, Panorama, continuous shooting and much more. The front facing camera is even less fascinating than the at least decent rear one. It does, however, give you the option of saving the photos you take in either landscape or portrait orientation but can only take photos in an even smaller resolution: 640 x 480. Video recording is an option using both of the aforementioned cameras but don’t expect the next Hollywood movie to be shot with the LG Optimus L70. The quality of the videos shot with it will be underwhelming to say the least, ranging from resolutions that don’t exceed 800 x 480 for the rear camera and 640 x 480 on the front facing camera. At least that makes video conferencing possible, to a degree. 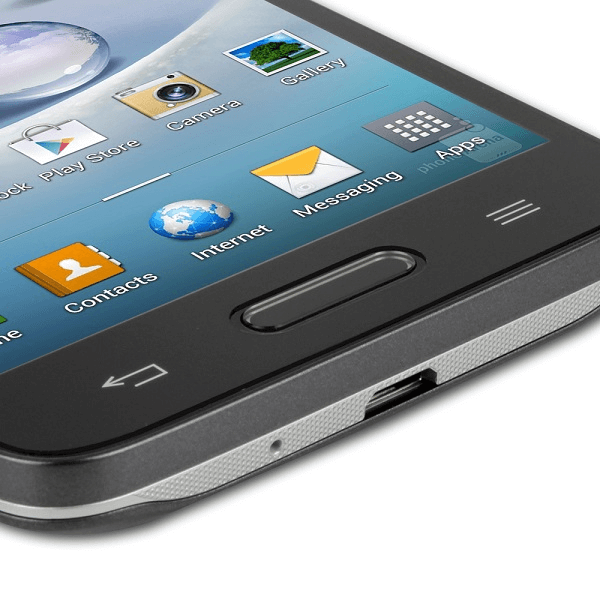 The phone promises between 11 and 12 hours of talk time thanks to its 2,040 mAh removable battery. It’s a decent power pack that will keep the phone going for a fair while, especially given the rather low maintenance display. Even watching videos will keep your battery away from the charger for several hours at a time. Form that perspective, the LG Optimus L70 is a great and reliable thing to have and not find yourself in the position where you always have to carry the charger around with you. Charging it isn’t the lengthiest of processes either as you’ll probably not need more than 2-3 hours at most to get a full charge going. So, to wrap it all up, by purchasing the LG Optimus L70 you’ll be granted with a great and reliable method of handling your daily businesses in terms of calling, emailing and most of the more basic apps. It’s a great phone that doesn’t overdo display size but in retrospect, you miss out on many features that more recent phones come with. 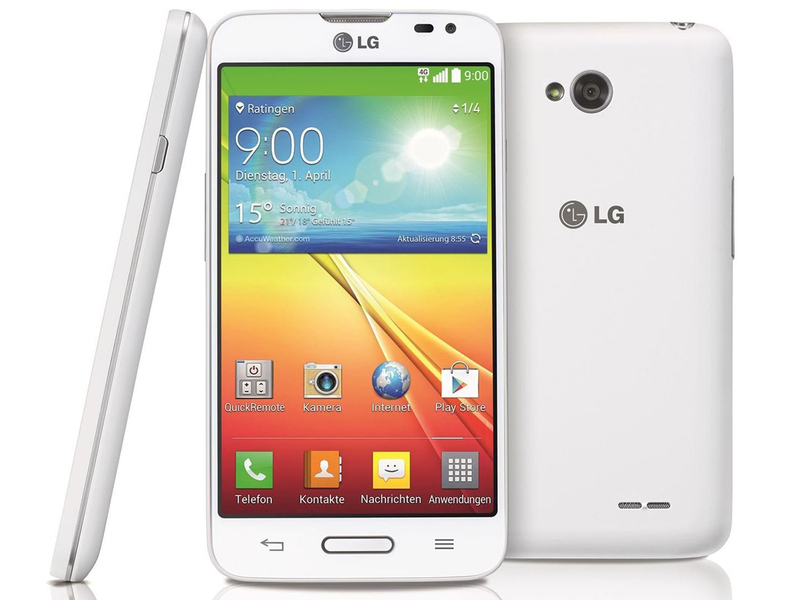 With a particularly power-hungry build and full access to Android-centric applications and feature, the LG Optimus L70 is worth taking a closer look at if you’re searching for a budget smartphone. You can purchase the LG Optimus L70 from various online and retail stores. It’s listed at prices between $50 and $75 on most of the above, without a contract.